The people you spend the most time with are the ones who influence you the most. That’s great news when those around you have healthy habits and support you in your health journey, but bad news when they don’t. Anyone who’s tried to start a new exercise habit or diet knows how tough it is to stick to it when your partner, family, or friends are not on board with it. When you’re trying to cut processed food from your diet and your husband or wife keeps putting cereal and cookies in your shopping cart, positive change can be hard. Having emotional support is essential when you’re trying to make any upgrade in your life — from quitting sodas to going on a fat loss diet. So how can you find that support or get it from your current relationships? Today I’m joined by two guests who cracked the code: Dr. Jesse Chappus and his wife Marni Wasserman. 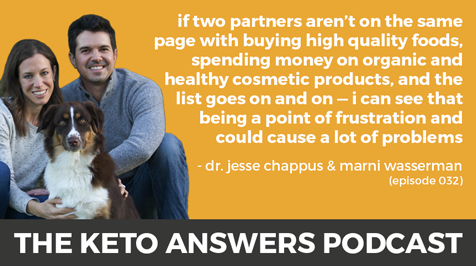 Jesse and Marni met through their passion for health and food. He was a chiropractor while she was a holistic nutritionist and chef with a successful food studio. Just a few months after they started dating, they decided to launch a health podcast together to share their passion for health and wellness with others. Now they co-host the uber-successful The Ultimate Health Podcast full-time, have quit their jobs, and own a successful online health business. In today’s episode, they share their individual health journeys, how to find the emotional support you need to reach your health goals, how they found that support in one another, what it’s like to run a business as a couple and a lot more.